How many times have you heard someone say, “new year, new me?” Let’s be real: it can get kind of annoying. That’s why we’re focusing on something more straightforward this year: organizing your utility storage shed! The easiest way to achieve a more organized house is with better storage, whether it be inside or outside in a utility building. Unfortunately, many people don’t know how to get started on their storage journey. Want to get organized and don’t know where to start? Keep reading to discover these 9 tips for better storage in 2019. One reason why people sometimes don’t have enough storage is they don’t have enough space. But what if you could have it all? A great storage solution is to use free-standing metal shelves. They are available in a variety of sizes, making them perfect for not only your utility building, but anywhere in your home. These shelves fit easily against any wall and don’t take up much space. But the ability to vertically store as many things as you need can help you save a lot of space in the long run. If you put together a lot of things over the years, then your home is probably filled with tons of nails and screws. You probably want to keep them separate from everything else, so you throw them in your utility storage shed in the backyard. But they are still inconvenient to store due to their small and weird shape. A delightfully simple storage solution is to keep all of your nails and screws in jars. This gets the items out of the way, and then it’s easy to put the jars on a rack or on a shelf. They are easy to access, but no longer in the way. Don’t have room for conventional shelves? There’s a pretty simple solution to that: floating shelves. You can easily add floating shelves to your utility storage shed, or any room in your home for that matter. The “floating” nature of the shelves means there is plenty of room beneath them for other things. Meanwhile, the shelves can help you store anything that you need to. If you’re worried that these shelves will visually clash with the room you add them to, don’t worry. It’s possible to go the extra mile and paint these shelves the same color as the rest of the room, allowing them to blend in seamlessly. Many people use floating shelves because they don’t have room to put shelves on the ground. If you do have the room, though, you might enjoy this simpler solution: wooden crates! Wooden crates can be obtained on the cheap, and chances are that you have a few kicking around your house or utility building already. Each crate can serve as its own storage solution or you can stack them together for something larger. And while you may choose to give them a new coat of paint, that’s not always necessary: the wood provides a “shabby chic” look that goes well with just about any décor. Earlier, we mentioned the difficulty of storing things like nails and screws. You get a ton of those from using your assorted tools over the years. That leaves a big question, though: just where will you store your tools? There are a few good ideas for this, but one of the simplest solutions is to use little plastic tubs to store tools. The tubs help keep things organized in your utility storage shed while also not taking up too much space. Speaking of organization, tubs give you plenty of options. 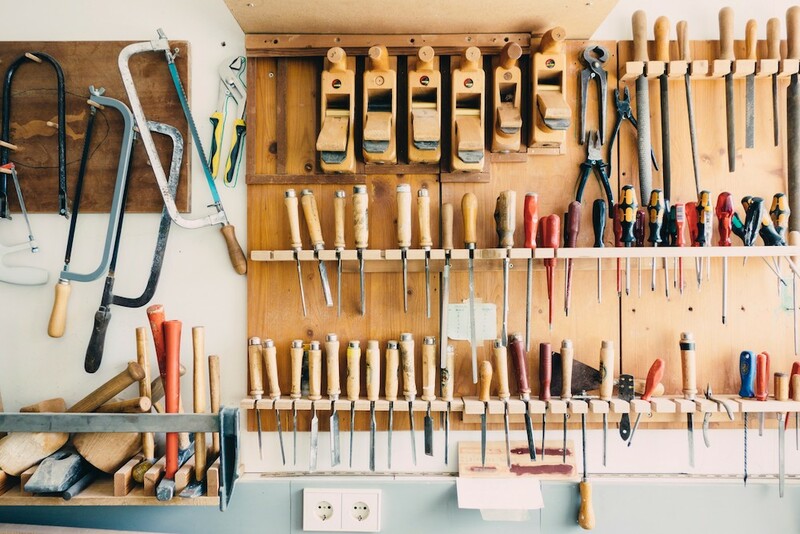 You can organize tools by type or maybe by the frequency of use, which can be a major time saver. Many of our solutions so far have focused on adding new storage. However, the next idea is simpler: it revolves around making better use of the storage that you already have. What are we talking about? Drawer organizers. This simple addition can turn any cluttered drawer into a clean and organized thing of beauty. While drawer organizers can be good for just about any drawer, they really shine in drawers of random accessories. Instead of having everything mixing together, you’ll now have everything exactly where you can find it when you need it. Whether it’s in your garage or your home, metal tools can pose a big problem. They take up a lot of room, and many of them are too big for a conventional drawer. Just how are you supposed to store these huge tools? One of our favorite solutions keeps things nice and simple: magnetic strips. You can add a magnetic strip to any wall, and this is especially handy for your utility storage shed. As a solution, it really is that simple. Once the strip is in place, all of your metal tools can hang effortlessly from the wall. That means they are out of the way but still easily accessible. You’ve probably noticed a pattern here: there is no one magical “best storage solution.” Instead, the best solution tends to change based on what you are trying to store. For instance, paint brushes can be particularly difficult to store. How can you keep these things organized but also easy to see for when you’re painting? One of the best simple solutions for this is to use mason jars. These jars don’t take up much space, but each one can store several brushes, and the transparent jar helps you see inside to make sure you’re getting the right brush. Sometimes, the biggest problem with storage comes from the biggest things. For instance, when you try to store something really large (like sports equipment or tents), it doesn’t leave enough room for anything else. The best solution for this would be to add some utility hooks to the wall. With the hooks in place, you can easily hang the items that need storage, and they no longer take up all the room that you need for everything else.